We went to a cafe to eat a hearty breakfast…and that’s what we got. I had eggs, hash browns, bacon, biscuits and gravy, a huge cinnamon roll, and lots of coffee. The weather didn’t look good – overcast skies threatening to drop rain. As we left town, we saw the Texans tent still pitched in the park. They seem to have a very relaxed (or non-existent) schedule compared to us. It rained lightly as we rolled easily on flat pavement. It was as though we were in some kind of paradox. The storm was moving away from us in the direction that we were riding, yet still we had a strong headwind. I was only five minutes behind when we met at the junction of CO 15 and US 285. I bought a coffee at a gas station. 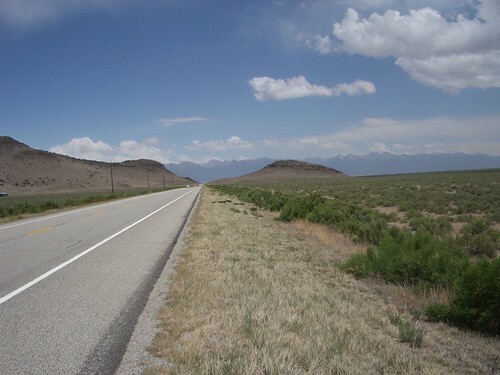 Next stop: Saguache – 25 miles north on 285. This was a very pleasant ride. We had tailwinds almost the entire way. At times I did a steady 25 mph! 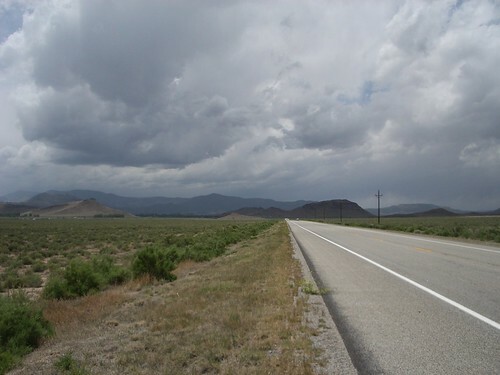 In Saguache, I bought lunch and energy foods (Oreos, Dr. Pepper, and little brownie snacks, and trail mix). We still had 40 miles and a mountain pass between us and Salida. I ate and phoned home. When I was talking to my father, he got online and checked my SPOT to see (down to streetview) exactly where I was. Mathieu and Auke found the local library and were getting caught up on internet things. I called my mother (she wasn’t home when I called my father) while waiting for them. It was past 15:00 before we rode out of town. Right away, I saw a storm brewing to the south of us, heading our direction. It looked like it would rain heavily and soon, so I cleverly put on my rain jacket. The wind from the storm was blowing right to left for us. It was so strong that at times it tossed me from the right edge of the shoulder nearly into the traffic lane. Our road slowly curved to the left, meaning we would get to enjoy the wind at our back. Still, the storm had not hit us yet. So much for my preemptive rain protection. With the tailwind, I easily rode the remaining miles to our next meeting place – a roadside coffee shop. I had another coffee and a piece of pie. A motorist came in to ask for directions. He had no idea where he was or where he came from. He had to be asked “did you just come over a big mountain?” (our upcoming pass) to figure out his direction. It was beyond our comprehension to be so clueless to and unaware of the surroundings. If it happened to us, we could easily get in serious trouble. Although we were heading the same direction as before, the wind was no longer helping – it was now blowing directly in our faces…hard. 35 mph gusting to 50, if I had to guess. With my flat font end, I had difficulty keeping the bike moving forward. When I lost momentum, I’d pull the handlebars one way of the other, and then the wind would pull me further to that side. With traffic on one side and a guardrail on the other, I had to put a foot down often to keep from running into either. The temperature dropped quickly, so I stopped to put full rain and wind gear on. I continued riding/walking. A lot of drivers gave me sympathetic waves and head nods. I was going nowhere fast and needed quick energy. I ate a dozen Oreos from a pack I bought in Saguache. Up ahead, I saw a green sign…the kind that denotes the top of a pass! I rode to it and read “Poncha Pass 5 miles ahead.” That was disappointing. I kept my cycle of riding and walking. I didn’t know if I could make it all the way to Salida. I constantly looked on the side of the road for places to pitch a tent just in case. The few ranches and houses I passed, I judged whether they would let me camp in their yard for the night. I rode on, though. The wind lessened in intensity and the grade leveled. Suddenly, I felt a sharp pain in my neck. It felt like a pinched nerve – probably caused from gripping and pulling on the handlebars so tightly. The pain came and went. At times, it was so sudden and intense that I had to stop riding. After one last push, I finally made it to the top! I ate more Oreos and briefly shed my rain/wint layers. I needed to dry out before descending to Poncha Springs. Without having to pedal, there was no way of keeping warm – not when riding 20 to 30 mph with temperatures in the low 50’s. As I descended, the valley in which Poncha Springs and Salida resided came into view. It was filled with dark rain clouds. At the base of the descent, I found Mathieu and Auke waiting in a gas station. As soon as I arrived, we continued the last 6 miles to Salida. It started raining, making the miles very unpleasant. We checked into a Day’s Inn and shed our wet clothes. The desk clerk was from Poland and ensured us he would give us a good price because my European partners. I picked up a pizza from Dominos and ate it in the comfort of our warm, dry room. Tomorrow, we will visit a bike shop – the first since Silver City, NM. I can’t wait to get new tubes. This entry was posted in Journal on August 24, 2010 by dave.